YAY! 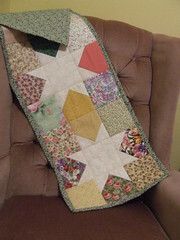 I finally finished Meaghan’s quilt this week. Her birthday was Nov 1st. Remember, I also made a quilt for her brother and his birthday was the day before. He got his quilt on time tho. 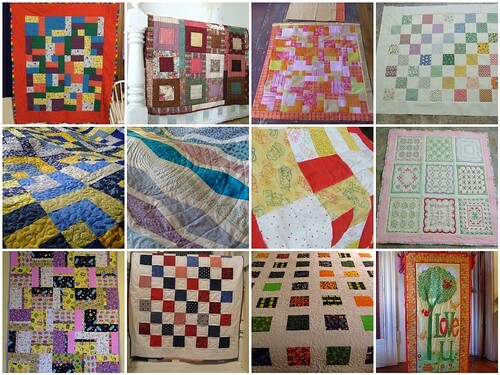 I used the same pattern for both quilts, except for Meaghan I sized the blocks smaller to 5″ and made the sashing smaller as well. This brought it down to a twin size. She picked purple and grey as her colors. It sewed up fast enough but both Meg & I hummed and hawed over how to quilt it. Finally we decided to go for diamonds in the sashing areas. 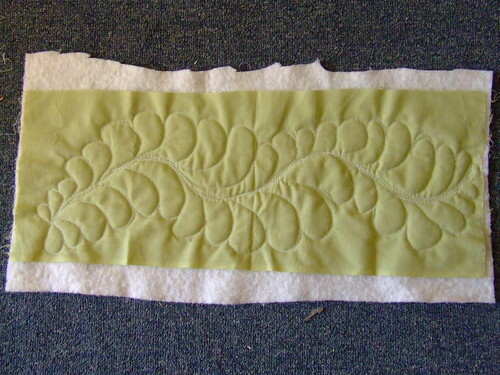 When I finished that part, she picked a curved leafy design for the borders. That was not something I want to quilt again any time soon. They are small and detailed. After another long period of indecision, I went and quilted loop squares in the squares .Those were pretty fun! It worked up fast too, as I just went in a straight line down the side of each square to get to the next one, and went around the quilt in a big circle towards the side. This made nice lines on the back as well. I bound it in a grey on grey floral she picked out from the Thimbleberries line. Just straight cut, 3″ wide, folder over and sewn down on the front. She’s happy, so any mistakes are noticed only by me. It crinkled up real nice after washing as well. There’s a shot in here of the border before and after washing.The denser quilting on the border definitely crinkled up really nice. 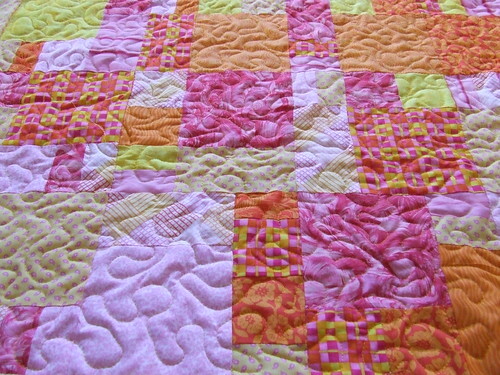 So I was poking around, taking a break ad quilting, when we finally settled on a border pattern for Meaghan’s quilt. It’s a curved fern design from Follow the Line Quilting Designs volume 3 (heads up: I LOVE this kind of thing). The only problem was, in the one corner sample given, the leaves changed direction. It was not a simple matter to simply mirror image the pattern itself to be able to turn the next corner. The leaves themselves would have had to turn direction midway. I’ve been mentally trying to figre this out since yesterday afternoon. Then I made extra copies of the designs, scanned it in and flipped it, printed off those and even then could not get it to line up. So we turn to the old fashioned way of pencil and paper. I got another sheet, made sure each side of the border I traced was heading to the corner in the right direction, then figured out how to fill in a leaf myself. Final result with the original corner and the drawn version of the next corner. 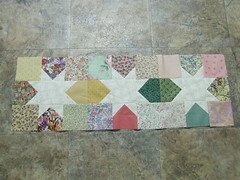 Each corner will be used twice in one quilt, at opposite corners. Note how in the original the leaf is tucked in and you hardly notice the direction change. In the opposite corner, the leaf has to point out, or at least look like it did. Now I can stop thinking about how to do it and maybe go quilt some more. But it was baby quilt sized and it sold out of my Etsy shop rather quickly. The up side was I looked at the leftover fabrics from that quilt and realized I could make a whole ‘nother quilt! Some more brain waves, a couple of scrap bag finds later and I introduced purple into the mix. The only think extra I bought was a fat quarter of a really bright orange batik print. It was mostly orange and yellow but with a faint pink /purple in some spots. Perfect! I picked the perfect pattern to highlight the fabrics and more importantly use them all up. There are large 6.5″ by 15″ blocks and since I was stretching out the color scheme with some solids too, I knew I had lots of space for creative quilting. The only thing that came to my mind was feathers. Which I had never done. Those following on flickr saw my multiple tests and tractising to get it right. Not only does it lok good, it’s pretty fun to do too. 🙂 And by the time I get all the blocks done on this quilt, I should be pretty good at it. Here is the quilt on my design wall. Right before Christmas I was still attempting to at least get the top all pieced, but alas. It was not to be. So last night I really needed a sewing break, so I made sure I worked on this quilt alone. I got pretty far, but I think I mis-pieced the middle row. Good thing I have pictures from earlier to check… except by them I was tired enough I could not find the pic on my camera. 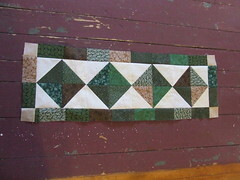 There was one row I pieced with the long pieced sashing and the horizontal bars were not lining up. So I did take my handy seam ripper and rip out that very long seam and pinned it to line it up in a couple spots and sewed it all over again. Much better. Not long to go now. 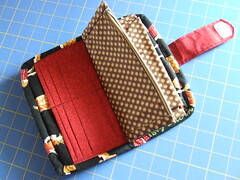 Then I will piece all of the leftover fabrics for a pieced back because I really really want to have no leftovers. 😀 I’ve angsted on the back for a while too. The quilt shop has some really cozy fluffy soft fabric, but the colors are dull and muddy. They also had a bright yellow mottled backing fabric (no piecing needed) expect for some reason I think that is too plain. I also picked out a poly batting to try again with this machine and because it will make it poofy. Kaytlyn also likes heavy quilts so I may find a flannel sheet to put in the middle as well, but I don’t know how difficult that will make it to quilt, with my quilting plans. I may have to skip that bit and make a simpler but heavy quilt for the both of them later. *janitorial notice – I’m going to try and use the built in image galleries a little more, see if I can figure them out and see if I can eventually replace flickr. Let’s see how much more backlog I can clear out in 2012. Edit: after all that work I just realized I forgot Sarah’s blue & white quilt an I think Izzy’s quilt I gave to her last Christmas….